Murphys Solicitors is an established legal practice in its third generation located on Dun Laoghaire Main Street. We attend regularly before the Dublin City Courts, Dun Laoghaire District Court as well as the Courts in Bray, Wicklow, Wexford and many more. Our opening hours are Monday – Friday, 9am – 1pm and 2pm – 4.45pm. On street parking is readily available or in the nearby Dun Laoghaire Shopping Centre. 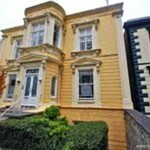 MURPHYS Solicitors, Mount Clarence House, 91 Upper George's Street, Dun Laoghaire, Co. Dublin.